Whether you’re shopping for a coffee machine or wine cabinet, DeLonghi aims to take its passion for Italian culture and uses it to create its range of products for ‘people around the world who enjoy fine Italian products’. Operating since 1974, the brand caters to different ‘cultures, lifestyles, environments and homecare routines’. Some of the products available include coffee makers, toasters, dishwashers, fans, portable air conditioners, heaters, cooktops and ovens. 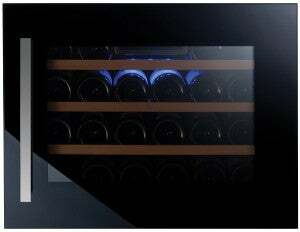 If you love your wine, DeLonghi has a number of wine cabinets suitable for everyday storage and as a showpiece. Each model is claimed to provide an ideal environment, as they apparently allow wine to perform its natural aging process. You can also choose to set a specific temperature when storing the wine. The settings can range between 5°C and 18°C, with the humidity level usually kept between 55°C and 75°C. Each wine cabinet available is strictly for serving or storage use only. They cannot be used to preserve fresh food. If you’re looking for an affordable wine cabinet from the brand, the DeLonghi DEWC30S is the cheapest option available from the collection. The unit has six beech wood shelves with mould resistant coating and is said to provide enough room for up to 30, 750ml Bordeaux-style bottles. It includes many of the same features also contained in the brand’s other various wine cabinets. Some of these include LCD Display, tinted triple glazed doors and Key Lockable and Front Venting. The DeLonghi DEWC54S comes with seven beech wood shelves, with mould resistant coating and is said to fit up to 54 750ml Bordeaux-style bottles. Featuring many of the same functions contained in the range, this wine cabinet similarly comes with a security lock system with a front venting to keep your beverages safe. Other available functions include vibration absorption pads, adjustable levelling legs, and an active carbon filter. The DeLonghi DEWC166S wine cabinet is the most expensive item in the range and comes with 16 beech wood shelves, with mould resistant coating. It can store up to 166, 750ml Bordeaux-style bottles. If you’re searching for a wine cabinet with an attractive design, the DeLonghi DEWC166S includes a range of features aimed to combine function and aesthetic. To minimise condensation, the product is made with triple glazed doors which also contain a UV tint to avoid your items from being damaged by light. The telescopic shelves are similarly made with a stainless steel fascia and is said to provide a convenient way to view, arrange and access your wine. Should I buy a DeLonghi wine cabinet? Take control of your wine collection and find the right wine cabinet for you. DeLonghi may be an ideal option for wine lovers as each model is claimed to provide a suitable environment to store bottles while still ensuring the wine can continue its natural aging process. The price for the various models can range between $1,099 and $2,599. Many of the wine cabinets available share a number of features. Some of these include an LCD Display, adjustable leveling legs, Key Lockable and Front Venting, and a reversible door hinge. If you’re looking for maximum shelf space, DeLonghi’s DEWC166S Single Zone Wine Cabinet comes with 16 shelves and is said to fit up to 166 bottles. But if you’re looking for something more affordable, the DeLonghi DEWC30S Single Zone Wine Cabinet and the DeLonghi DEWC54S Single Zone Wine Cabinet are alternative options.